Some people are up for just about anything, as long as it has a promise of excitement and fun. Others have tendency to be nervous around new things and need to weigh the situation and decide if it is right for them ahead of time. 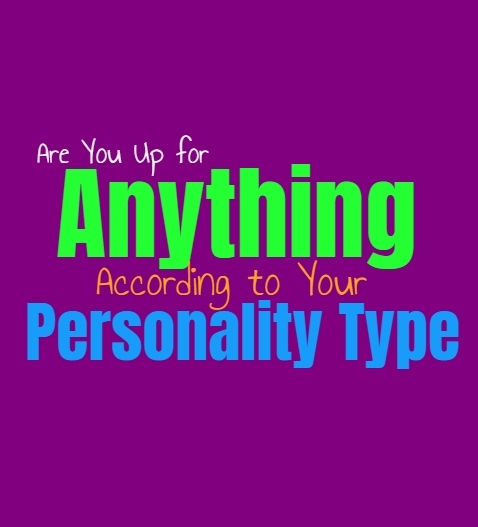 Here is whether or not you are up for just about anything, based on your personality type. INFJs are certainly up for having fun with loved ones, but they aren’t really up for anything. They don’t like taking chances on things before really thinking about the choice they are making. For the INFJ it is important to consider their choices, and not to live too recklessly. They are willing to have a good time though and are often more up for new things when they are around someone who inspires this within them. When they are with someone they trust the INFJ can often be more capable of following them into these new experiences. ENFJs don’t really enjoy taking unnecessary risks, and so they like to be sure about their actions beforehand. While they don’t always jump into things unprepared, this doesn’t mean they aren’t up for new experiences and fun things. They are more likely to be up for anything when they are around people who inspire the more adventurous side of themselves. They like to be able to experience having a good time with the people they love, and are often willing to do just about anything to make those people happy. INFPs are pretty much up for anything when they are around people who inspire their eager and adventurous spirit. INFPs want to be able to experience things and don’t like feeling stagnant. They are more fulfilled when they get a chance to really try new things and dive into different creative experiences. When the INFP is stuck in the same place for too long they feel trapped and like they are distant from who they truly are. ENFPs are often up for just about anything as long as it fits into their morals and is something they are interested in. They like being able to enjoy themselves and have a good time with the people they care for most. If someone the ENFP loves wants to try something new and dive into a different experience, they are often eager to do this with them. ENFPs are passionate people who dislike feeling stagnant or trapped in the same boring place for too long. INTJs aren’t really up for anything, since this seems a bit foolish and reckless to them. If they don’t want to do something they won’t simply dive in for the sake of impressing someone else. If an action or choice seems stupid to the INTJ, then they won’t do it. They don’t need to be up for anything in order to have a good time and experience what they want from life. They would rather be sure about a choice before making it, and are perfectly capable of walking away. ENTJs are not really up for anything, since they would rather make choices which are smart. They want to consider an action before moving forward and want to be sure it is the right choice for them. While they do enjoy experiencing excitement in their lives and want to be able to have a good time, that doesn’t mean they are up for anything just for the sake of seeming adventurous to others. ENTJs do what they want without needing to constantly answer to others about their actions. If they believe something is foolish or pointless, then they really don’t need to do it. INTPs aren’t necessarily up for anything, but they are definitely more willing to try new things than most people. They like having people in their lives who are spontaneous and willing to try new experiences. INTPs are often up for trying something even if it seems a bit scary to others. They want to be able to dive into something exciting and really hate feeling stagnant. INTPs might not be up for absolutely anything, but they are certainly up for a lot of things. ENTPs are definitely up for plenty of new experiences, and are pretty much up for anything. They don’t do something just to impress others, but they do like being able to experience new things. ENTPs really hate stagnancy and want to be open to new challenges and adventures in their lives. They want to feel free to learn about something and dive in without feeling frightened or spending too long needing to think about it beforehand. ISTJs aren’t really up for anything, since this feels a bit foolish to them. They would rather think about something before diving in and want to be sure they are making the right choices. For the ISTJ people who are just up for anything seem a bit reckless and even irresponsible. They believe in being prepared and being sure of their actions. This is why ISTJs are such dependable and trustworthy people, because they make choices that they can stand behind. ESTJs aren’t up for anything, since they want to be sure they are making smart choices in their lives. They do enjoy having a good time, but they prefer to participate in things which they know and understand. ESTJs are willing to have a good time but that doesn’t mean they are willing to try just about anything. They would rather be sure that they are doing something smart and want to prepare themselves before diving into something. ISFJs are not up for anything, since they prefer to be sure about something before moving forward. They also don’t enjoy constantly having to experience new things, and value some consistency in their lives. While ISFJs are more willing to try new things than people realize, this doesn’t mean they want to do this on a constant basis. For them it becomes unsettling and exhausting when they are around people who just want them to be up for anything. ESFJs definitely aren’t up for anything, even though they do enjoy new experiences more than people understand about them. ESFJs are willing to try something new when they are around someone who inspires this in them. They do want to make their loved ones happy and will try to be supportive and be more adventurous if this is what they want. Usually ESFJ prefer come consistency in their lives though, and want to be able to enjoy their comfort zone sometimes. ISTPs are pretty much up for anything, since they don’t like feeling stagnant in their lives. They want to be able to experience something new and they aren’t afraid of diving in. When they are feeling a bit bored or stuck, then the ISTP definitely wants something new to jump on board with. They are willing to try something even if it seems a bit reckless and are not afraid of just having to pick up the pieces later on. ESTPs are pretty much up for anything, and enjoy when people suggest new things to experience. ESTPs like feeling open to anything and want some spontaneity in their lives. Feeling trapped in the same stagnant lifestyle is truly upsetting and draining for the ESTP. If someone they care for suggests something a little bit reckless and adventurous, and they are almost always up for this, as long as it isn’t something offensive or hurtful. ISFPs are definitely adventurous people at heart, and so they enjoy being able to experience new things. They don’t like feeling trapped or stagnant and really do like being able to dive into something new. They desire passion and excitement in their lives and so they are pretty much up for anything new as long as it doesn’t go against their internal values. ISFPs won’t do things which compromise who they are, but outside of that they are certainly up for anything. ESFPs are adventurous people who are pretty much up for anything. They love being able to experience new and exciting things, especially with someone they know and trust. ESFPs don’t like feeling stuck or stagnant in the same place for too long. Just sitting around living inside of their comfort zone is really something which makes the ESFP unhappy. They want to be able to experience new things and so they are certainly up for anything, as long as it is fun.